My friend Quinn added these cookies to her holiday repertoire and festive they are. But now it’s January, holidays are over, and we’re all getting over our holiday hangovers. But with these cookies – packed full of almonds, honey and flax – you need not worry. They are tasty, nutritious, light, and surprisingly simple in all their (almost) vegan glory. They do have honey in them which, if you are a hard-and-fast-vegan, you might not like. But find happy honey where the bees are treated right or substitute with agave nectar. The original recipe comes from Andrea Sarjeant who is a holistic nutritionist based out of Toronto. She also makes them with ½ teaspoon of ground ginger and peach or apricot jam instead of raspberry. Whatever tickles your fancy. Preheat oven to 350. In a large bowl, combine the almond meal, almond butter, honey, flax and cinnamon. You may need to get your hands in there to thoroughly mix everything! Test the dough’s stickiness by forming a small ball. If it’s too crumbly and won’t hold together, add one to two tablespoons of water. Using a tablespoon to measure, scoop out some dough and form it into a ball. When the ball looks tight, put on cookie sheet lined with parchment paper and make an indent with your thumb. This is where you’ll put the jam. Repeat with the rest of the dough, then add the jam to each indent. Bake in the oven until the cookies are browned, around 10-12 minutes. Remove from oven and allow to cool before eating, as the jam will be very, very hot. 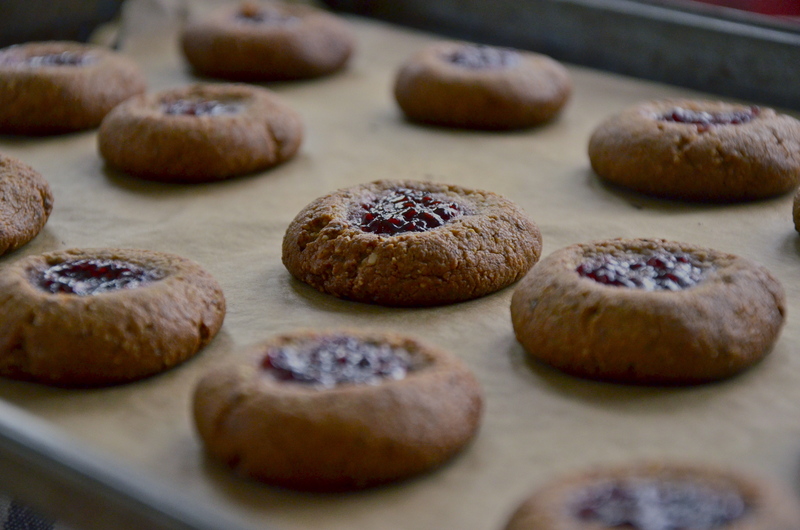 I’ve been looking for a new vegan cookie–can’t wait to try these! I just reorganized my baking drawer and found some more almond meal … I think I’ll make them again this weekend. So tasty.